Don't you just love the deals you get from deal sites nowadays? The only bummer is that most of the deals are limited time offers, so if you don't get around to clicking on the deal of the day, you're out of luck. CityDeals also features daily deals like these, but unlike average deal sites they even offer deals that aren't limited to the one-deal-a-day concept. You can get your deals via print-at-home option or via certificate (great for gifts! ), and they even have Request-A-Deal (if the deal you want isn't in stock, they'll try to get it for you!) and referral bonuses. CityDeals.com is already in many cities across the US -- and great news for us deal-seekers living in the SF Bay Area, they are coming to San Francisco in 2011! * San Francisco Giants game package which includes tickets, food and apparel. Enter by Feb. 6, 2011 to be eligible to win -- and don't forget to refer as many friends as possible to the giveaway, and tell them to enter your name in the "referral" field, because for every friend you refer who enters the giveaway, you will receive an additional entry! Disclosure: This is a sponsored post courtesy of the One2One Network. Contest information is provided by the featured company/product. The views and opinions expressed here are my own. I am one of the most absentminded people I know. I can never find my keys or my phone. I perenially miss play dates, birthday parties, school volunteer hours and after school pickups. I'm also messy Not exactly a winning resume for the family CFO, yet I'm stuck with the job. If it weren't for the modern-day miracle of Auto Payments, I would either be paying a fortune in late fees, or be a walking nervous wreck. All fixed monthly payments, such as mortgage payments, life insurance payments, the kids' college fund contributions, ballet school tuition, etc.. get debited directly from our bank account. 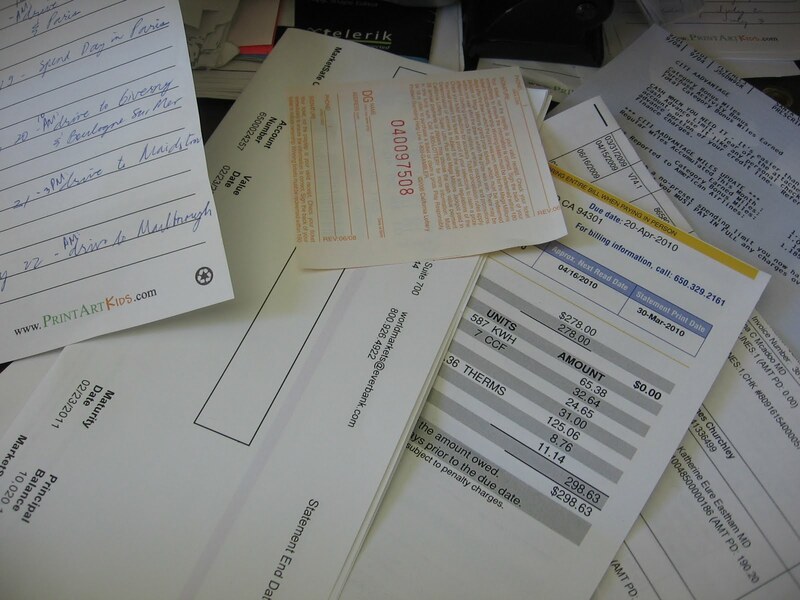 Also, I put most variable payments like phone bills, utility bills, insurance bills (i.e. the premiums change from year to year) on my credit card so I can review them all together on my credit card bill. I know, that sounds counterintuitive -- of course you should be saving lots! -- but what I mean is, we've set ourselves a "working capital balance" in our checking account, we add a buffer, then we periodically reroute any extra cash to a high-yield savings account or cd, or invest it in the stock market. We indulge ourselves with little treats only if we have enough money in our checking account; we don't have easy access to the money in our other accounts, so we're not tempted to blow it all on a weekend in Vegas. If we ever do need to get our hands on a significant amount of money for some emergency, we maintain a HELOC that we can draw upon at any time, at a far lower rate of interest than credit card debt. We've never used it and I hope we never have to, but I'm glad it's there. I keep a filing cabinet with folders for bank statements, bills, and anything we'd ever need to reference. With the advent of e-statements, my files have grown considerably thinner, but I still keep paper copies of things that don't have electronic copies. For example, I every year I compile a tax folder with W-9 forms, INT-99 and other forms sent by banks, brokers, etc.. , mortgage forms, charitable donation receipts, vehicle registration forms and a ledger of my blogging expenses, so on the off chance that I get audited, I'll be ready. Speaking of taxes, if your tax situation is simple then there's absolutely no reason to do your taxes by hand, given the ease of the software programs out there. I've used TurboTax every year since 1996, with the exception of 1999, when I was at business school and wanted a tax professional to give me advice on whether I could deduct the cost of my laptop as a business expense (in hindsight, I probably could have figured that out using TurboTax, but hey, I was up to my ears in case studies), and I've been very happy with it. This is probably the most significant way we keep our finances in control: we only spend what we can afford. Yes, we do use credit cards, but only for the convenience and the perks (i.e. cashback, miles, etc..). We pay our credit card bills in full each month (okay, I admit I've procrastinated or forgotten to pay -- usually when I'm on vacation -- and I've ended up paying a late fee plus a couple of dollars for a couple of days' worth of interest, but that's only happened a couple of times in my life). The only time we'd make an exception to that would be if we needed a new car or if we had a medical emergency. The greatest love story ever told, starring...garden gnomes? In the upcoming “Gnomeo & Juliet,” Shakespeare's revered tale gets a comical, off-the-wall makeover. Directed by Kelly Asbury (“Shrek 2”) and showcasing both classic and original songs by Elton John, the film features the voices of James McAvoy and Emily Blunt as Gnomeo and Juliet, who have as many obstacles to overcome as their quasi namesakes when they are caught up in a feud between neighbors. But with plastic pink flamingos and thrilling lawnmower races in the mix, can this young couple find lasting happiness? See you at the movie theatres on Feb. 11! Leave a comment on this post and tell me your favorite Shakespeare love story. This entry must be completed before extra entries qualify. This giveaway ends at 11:59PM PST on February 8, 2011; I will draw 2 winners at random on February 9 and post the winners names after they confirm acceptance. While every effort will be made to accommodate the winner's choice of tshirt color and size, I cannot guarantee that the choice will be available. Continental US residents only. For additional giveaway rules, click here. Good luck! Disclosure: I did not receive a sample or monetary compensation for this post. Thanks to Disney for providing the giveaway prizes. Movie information is provided by Disney and is clearly indicated in italics. The views and opinions expressed here are my own. Welcome to Bonggamom's Friday Finds, your one-stop shop (okay, post) for finding the bestest giveaways around the blogosphere. Thank you to everyone for leaving your giveaway links and comments, I really appreciate the support! Here's what Jammy said: Love is when you hug, kiss and play with someone, and you like each other. Here's what The Pea said: Love is when you strongly like each other. It's a bonding between 2 people, and it brings happiness. It's the strongest force in the world! I asked her to explain that last thought, and she responded with: Love makes people kill themselves. 3Po's answer: Don't you know? Wouldn't that be a perfect message for a Valentine's Day card? After a bit more persuasion (in the form of a chocolate-chip cookie), I was able to get 3Po to elaborate: Love is weddings. It's when you like someone so much that you want to kiss them and hug them and snuggle with them and live with them for the rest of your life. Another Valentine's Day message that would rival any greeting card you get in a store -- and with Tiny Prints personalized greeting cards, you actually can put that message (or any other message you want) on a Valentine's Day card. If your taste runs to more traditional messages of love, Tiny prints has that too, along with Valentine's Day stickers, gift tags, kids' cards and other ways to let your loved ones know what love means to you. 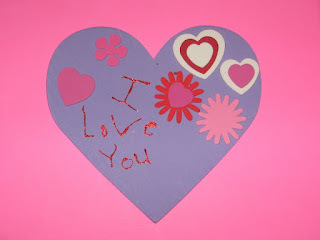 Click here to see everything that Tiny Prints has for Valentine's Day! 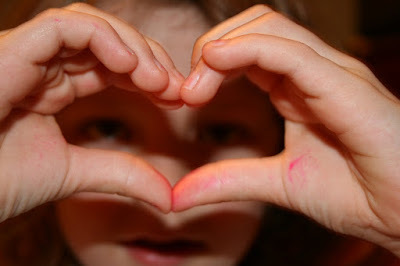 Stay tuned for my Valentine's Day post on Finding Bonggamom with more thoughts on love from 3Po, Jammy and The Pea! Disclaimer: Compensation for this post is provided in the form of a Tiny Prints gift card, courtesy of Tiny Prints and Global Influence.The views and opinions expressed here are my own. * Oats are a great source of protein, dietary fiber, vitamins, minerals and phytonutrients. * Since oatmeal is high in fiber, eating it helps keep you full longer, which helps with weight management. * The whole grains in oatmeal help control blood glucose levels and give you a steady source of energy. * Oatmeal is wonderful for dry, itchy skin; the natural, lubricating fats in oats allow oatmeal to be a great moisturizer and can leave a thin layer of protection on the skin. The only problem with oatmeal is how long it takes to cook; instant oatmeal takes only minutes in the microwave, but the flavored varieties are quite high in sugar. But ever since I reviewed Better Oats oatmeal last year, it has become my oatmeal of choice. Their varieties are generally lower in sugar than other instant oatmeal brands, they use 100% whole grain oats, and they add flax seed for extra nutrition. I'm addicted to the taste of their Oat Heads Berry Blast, and not a week goes by when I don't heat up a bowl or two for breakfast. I have it down to a science -- tear packet, pour into bowl, fill packet with water up to fill line, pour water into bowl, microwave uncovered on high for 1 minute, 20 seconds -- so even though my mornings are a huge rush, I can still enjoy a hot bowl of Better Oats oatmeal. Combine sugar, cocoa, butter, milk and peanut butter and bring to a boil. Remove from heat and add vanilla and oats. Stir until combined. Drop by tsp. on wax paper or spead in a pan, cool and cut in squares. * Last but not least, celebrate by joining my giveaway below! We're picking TEN winners so lots of people get a prize! To celebrate National Oatmeal Month, Better Oats is giving away TEN cases of Better Oats oatmeal to TEN lucky Bonggamom Finds readers! That's right, ten of you will get a month's supply of a variety of yummy Better Oats. Leave a comment on this post and share your favorite way to enjoy oatmeal. This entry must be completed before extra entries qualify. This giveaway ends at 11:59PM PST on February 14, 2011 (since oatmeal is good for the heart, and February is American Heart Month, and you know what the symbol of Valentine's Day is!). I will draw 10 winners at random on February 15 and post the winners' names after they confirm acceptance. US addresses only. For additional giveaway rules, click here. Good luck! Disclosure: I did not receive a sample or monetary compensation for this post. Thanks to Better Oats for providing the prizes for this giveaway. Product information was taken from the Better Oats website and is clearly indicated in italics. The views and opinions expressed here are my own. SoyJoy is holding a live broadcast today, featuring David Grotto, registered dietitian and author of "101 Foods That Will Save Your Life”, who will be talking about the new 2010 2010 Dietary Guidelines for Americans. The U.S. government updates them every 5 years, and they are due out next week, so David will be giving everyone a sneak peek at the new guidelines and giving some insights and recommendations. Tune in live on http://www.facebook.com/soyjoy later today (Thursday, January 27th) at 12:30pm EST to be among the first to see what the newest Dietary Guidelines has to offer! David will be answering questions live during the webcast -- if you submit questions online via facebook, twitter, UStream OR email, you could win a box of SOYJOY bars! Disclosure: As a thank-you for posting this information, I will be receiving a box of SoyJoy bars. The views and opinions expressed here are my own. Glee is one of my favorite TV shows. I've watched all the episodes (My favorite: Furt. It's still on our DVR, and woe betide anyone who erases it), I have the cast music on my iPod, and I consider myself a total Gleek. Alfie is mystified as to how anyone can enjoy a campy dramedy where people spontaneously burst into song, but I've always loved musicals, and I enjoy pretty much everything about Glee: the story, the characters, the actors, and of course, the music. If you're a fellow Gleek, you also know that the actors on Glee are as awesome in real life as their characters are onscreen. The cast is helping American Express raise awareness for their Members Project, and now Cory Monteith, who plays Finn Hudson on Glee, has also teamed up with the VH1 Save The Music Foundation and Apple & Eve Fruitables to for the second annual search for the Best School Music Mash-Ups in America. He'll be judging the entries and selecting the final schools; from there, two school vocal groups (one elementary and one middle school) will each be awarded $10,000 toward their respective music programs. Like Fruitables, a mash-up of fruit and vegetable juice, a music mash-up is the medley of two or more songs. Most recently made popular by primetime television, Fruitables is looking to spotlight school choruses across the country that have also mastered the newly popular art form. Elementary and middle school choruses, grades K-8, are eligible to enter by submitting a video of their mash-up performance via the Fruitables Facebook fan page, along with a 100-word essay describing their school’s need for music program funding. Entries must be received no later than April 30, 2010 and can be submitted via Facebook at www.Facebook.com/AppleandEve. favorite. The winning school will then be announced the week of May 17th. This contest is just one part of Fruitables' "Seeding the Arts" program, which aims to support underfunded music and arts programs across America. As part of the program, they have donated $30,000 to the VH1 Save the Music Foundation; in addition, Apple & Eve will make an additional $1 donation to the VH1 Save The Music Foundation for each new Apple & Eve Facebook® Fan between February 15, 2010 and August 31, 2010 up to a maximum donation of $20,000, for a total donation of $50,000. To celebrate the search for the second annual search for the Best School Music Mash-Ups in America, Apple & Eve is giving away a month's supply of yummy Apple & Eve Fruitables fruit and vegetable juice to one lucky Bonggamom Finds reader! Leave a comment on this post and share your favorite Glee episode. If you don't watch Glee, share which Apple & Eve juice product you would most like to try. This entry must be completed before extra entries qualify. Like Apple & Eve's Facebook page by August 31, 2011: for every new fan, they're donating $1 to VH1's Save the Music Foundation, up to $20,000! This giveaway ends at 11:59PM PST on February 16, 2011; I will draw a winner at random on February 17 and post the winner's name after the winner confirms acceptance. US addresses only. For additional giveaway rules, click here. Good luck! Disclosure: I did not receive a sample or monetary compensation for this post. Thanks to Apple & Eve and Hunter Public Relations for providing the prize for this giveaway. Contest information is provided by the featured company/product and is clearly indicated in italics. The views and opinions expressed here are my own. As big a fan as I am of global travel, when I think of the term "Family Getaway", an international destination is not the first thing that comes to mind. To me, a getaway is a place that's fairly nearby and easy to get to, which pretty much rules out any other country except the US, Canada and Mexic. But the United States is a huge country, and there is so much to discover! There are so many interesting places within a 3-hour drive of our home, let alone a 3-hour flight, that I could think of for a Family Getaway: Hawaii, Seattle, San Diego, Las Vegas, Yellowstone Park, Bryce Canyon... the list is almost endless. When I say budget-friendly, I don't mean you have to stay in roach-infested motels and eat cereal for breakfast (although we have done that -- the cereal, I mean, not the roaches). I mean it has to be one that your family can afford. If your great-aunt Edna surprises you with an extra-generous holiday present, go ahead and splurge! If you've been saving up, enjoy! If you don't have a lot to spend, search out low-cost or free activities. I don't want to be paying for a vacation months or years after we've taken it; a Great Family Getaway should be one that leaves you with great memories, not bills. I like getaways that have an educational component. I don't mean the kids have to learn math or science during our trips, but I want each trip to give them a new perspective on something in life. Whether that is realizing that not everyone speaks English, or getting them to see and enjoy the beauty of nature, I want everyone to come home from our getaway feeling that they have learned something new. I tend to be kind of a maniac when we take trips. If I had my way, we'd be on a schedule from 8AM to 8PM, but over the years I've learned that it just doesn't work. Someone always ends up cranky, tired or sick -- and then no-one has any fun. So now we always leave some time to chill out, relax and recharge. Sometimes the kids just like playing or watching TV in the hotel! A family getaway needs to be fun for everyone: my 9-year old daughter, my 7-year old twins, my husband and me. We have a wide range of ages and interests, and sometimes we have to compromise, but a Great Getaway should be one that has something that everyone can enjoy. And here are some Ideal Family Getaways that we'd love to do! Disclosure: “I wrote this blog post while participating in the SocialMoms and Alamo blogging program, for a gift card worth $50. For more information on how you can participate, click here. The views and opinions expressed here are my own. I was given some Valentine's Day coupon codes from Currentcodes.com, and I thought I'd share them with you because I know how expensive Feb. 14 can be. After all, V-Day is just one night, and you still need cash for the rest of the year! The tagline on Jenny Lauck's blog Three Kid Circus reads "Helping other parents feel superior since 1999", but it's Jenny who should be feeling superior. Not only is Jenny one of the funniest bloggers I read, she's also a powerhouse at BlogHer, where she heads the BlogHer Publishing Network and helps bloggers like me turn blogging into bucks via ads and blogger programs. Jenny is living proof that a mom of three can take control of her life and have a great career in blogging, and I want to be Jenny when I grow up. A couple of years ago I was selected to be a panelist for a back-to-school blogcast sponsored by OfficeMax, along with an award-winning teacher named Heather Wolpert-Gawron. She has won California Regional Teacher of the Year. She's a member of the Teacher Leaders Network. She owns the popular education resource blog Tween Teacher. She blogs for the Huffington Post and The George Lucas Educational Foundation’s Edutopia.org. She's met George Lucas, for God's sake! I was totally intimidated by her. That is, until I met her. Heather is friendly and bubbly and loud and total BFF material. She's also smart and passionate and outspoken. Her dedication to educating children and uplifting the standards of the teaching profession through policy and teacher education have inspired to support the teachers in my own community, and that's why she's on my list. 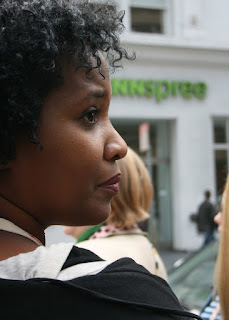 Karen Walrond's photography talent is remarkable -- when she led the Shutter Sisters Photography Walk at BlogHer 2008, she took photos with a regular old point and shoot camera, but managed to come up with the most amazing photos. But what I really find inspiring about Karen is her ability to look at everyday things and see them in a new light. Her Love Thursday meme, which I've participated in since 2006, is just that: finding and celebrating the love that's all around us. No "Inspiring Blogger" list is complete without the incomparable Anissa Meyhew. 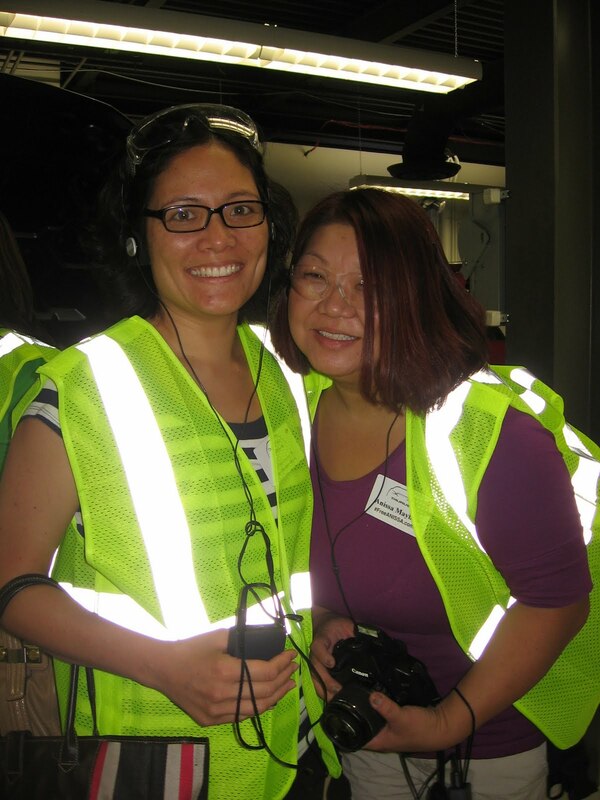 I met her on the Ford auto plant tour at BlogHer 2009, and her combination of humor, honesty, confidence and strength just blew me away. She has already inspired the blogging world as she wrote about her struggles and triumphs of being a parent to a child with cancer. After her stroke in 2009, which left her fighting for her life, Anissa could have retreated from the world and focused on herself, but yet again she has chosen to keep blogging. Even a stroke can't keep Anissa down! I told myself I would not include personal friends on this list, but I couldn't let the opportunity go by without giving Lia Freitas a personal shout-out. She has had a challenging year, dealing with divorce and unemployment -- yet she has come out on top, parlaying her blogging talents into a full-time job and using that confidence to get back into the dating scene. And she's done it all with a smile on her face, a chic haircut and gorgeous shoes on her feet. Her ability to overcome obstacles is truly inspiring! Blog With Integrity, as I do. I received compensation to use and facilitate my post. Do you have any plans for Valentine's Day? Alfie and I are going to a school auction party the weekend before Feb. 14th, but like most years, we have no plans for a romantic evening on V-Day itself. We usually do something fun with the kids, which is fine by us, because we're not into the overpriced roses and overcrowded restaurants that always accompany Valentine's Day anyway. If your Valentine's Day plans include your own little cupids, you might want to check out a new love-themed DVD featuring one of preschool-dom's most beloved characters, Wow! Wow! Wubbzy: "Wubbzy Be Mine". Get some Chinese food and snuggle on the couch with your preschoolers and this movie for a fun family Valentine's celebration! Roses are red…Wubbzy is yellow! 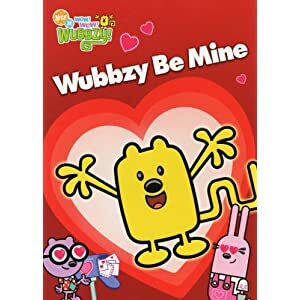 “Wubbzy Be Mine” (SRP $12.98) is an irresistible compilation of three episodes featuring the series’ well-loved characters, Wubbzy, Widget, Walden and Daizy. In “Mr. Valentine,” Wuzzleburg’s trusty mailman falls ill on Valentine’s Day and Wubbzy steps in to deliver all the valentines, but he soon discovers there are none for him…. To Wubbzy’s surprise, his pals personally deliver his valentines, saving the best for last! In “Cupid’s Helper,” Cupid pays a visit to Wuzzleburg, but loses his prized bubble-blower. When Wubbzy finds it, he starts blowing bubbles bringing together some of Wuzzleburg’s oddest couples. And, in “My Speedy Valentine,” the third love-filled episode on the new release, Wubbzy and his pals try to find the fastest way ever to make their own valentines, but something keeps bugging Walden…. To celebrate Valentine's Day and the release of Wubbzy's new Valentine's Day DVD, one lucky Bonggamom Finds reader will win a copy of "Wubbzy Be Mine" and a pack of special Wubbzy candy hearts, for even more "wuv"! Leave a comment on this post and share your plans for Valentine's Day. This entry must be completed before extra entries qualify. This giveaway ends at 11:59PM PST on February 6, 2011; I will draw a winner at random on February 7 and post the winner's name after the winner confirms acceptance. US addresses only. For additional giveaway rules, click here. Good luck! Disclosure: I did not receive a sample or monetary compensation for this post. Thanks to Grand Communications for providing the giveaway prize. Product information is provided by the featured company/product and is clearly indicated as such. The views and opinions expressed here are my own. We've lived in our home for over a decade, but I don't we're ever going to stop doing little things to improve it and make it the way we want it to be. It's always a work in progress; one year we'll put a new fence, another year we'll repaint the walls, another year we'll put up some shelves. One indispensable tool we rely on when we do any project that involves painting is a roll of ScotchBlue Painter's tape. They keep paint off the areas you don't want them, and peel off easily to give a clean, professional look! ScotchBlue Painter’s Tape is the number one choice for DIY painting projects because it achieves clean, sharp paint lines, and removes cleanly without leaving behind any residue. Painting continues to be the number on DIY project because it refreshes a room for as little as $100. There’s no better way to show the one you care about that you know his or her favorite color, and, more importantly, that you’ve been listening to their desire for a revamped space. ScotchBlue Painter's Tape is great to have around, even if you're not currently working on a DIY painting project! My kids use it to tape posters and drawings up on the walls; it's the only kind of tape we'll let them use because it doesn't mark our walls. And they are great for craft projects, too. Last December I painted a ceramic stocking-shaped ornament. Guess what I used to make sure the green and red stripes were straight? Here are a few ideas for painting projects from ScotchBlue. If you're thinking about a unique Valentine's Day present, keep reading! * ScotchBlue is the guaranteed way to ensure clean lines on a homemade Valentine’s Day card whether you’re using oil paint, spray paint, watercolor or acrylics. After all, homemade gifts are the gifts given with the most love. * Choose his or her favorite color to quickly liven up his man cave or her work space. Use ScotchBlue Painter’s Tape to ensure clean, sharp paint lines and easy tape removal. * Choose your favorite color and your partner’s favorite color to create a room you both will be happy with for years to come. ScotchBlue can help achieve a clean color blocking technique to seamlessly combine the two colors! * Use ScotchBlue Painter’s Tape to put his or her favorite team’s logo in the sports den, or adorn your loved one’s office with their initials to personalize a space. Disclosure: I received product samples from Scotch Blue, but was not paid to review the product or give my opinions. Product information and tips are provided by Scotch Blue and are clearly indicated in italics. The views and opinions expressed here are my own. I love Greek yogurt, and I love Voskos Greek yogurt. It's amazingly thick and creamy and tastes oh-so-indulgent (even though it isn't -- Greek yogurt is an excellent source of calcium and is low in fat!). The only thing more authentic than eating Voskos Greek yogurt would be eating Voskos Greek yogurt in Greece. Guess what? Voskos is giving you the chance to do both! They're sponsoring a fabulous sweepstakes for a trip to Greece. How fabulous is that?? The sweepstakes ends March 31, 2011 so enter on the Voskos Facebook page today! Disclosure: As a thank-you for posting about the sweepstakes, Voskos is sending me a pack of Voskos yogurt samples and other goodies. All sweepstakes and prize information was taken from the Voskos Facebook page. The views and opinions expressed here are my own. Welcome back to Bonggamom's Friday Finds! I apologize for skipping last Friday's edition -- I spent most of last week sick with a cold and didn't blog much -- but I'm back, and so is this weekly linky post. The physical benefits to walking more are obvious, but did you know that studies have shown that walking for 45 minutes a day, 3 times a week, can help improve brain function? A recent Newsweek article about Building a Better Brain claims that studies from the University of Illinois at Urbana-Champaign have found that simple aerobic exercise improves episodic memory and executive-control functions by about 20 percent. Inspired by this little tidbit, I've resolved to walk the kids to school more often. We already walk to school every day, but when I pick them up in the afternoons, I delay until the last minute so I'm forced to drive to school. This year I've set a goal of walking to pick the kids up from school at least twice a week. It's a small, attainable goal and one that I haven't broken yet. I've been way too sedentary, so I've resolved to get back into running this year. To help me stay movitated, I've signed up for a couple of races in March and May, and I intend to sign up for more before the year is done. I figure one race every two months or so will keep me training without getting so sick of the whole thing that I stop running in between races and train like mad the week before the race. 3) Get back into dancing. Another way I've decided to improve my fitness level is to put dancing back into my life. When I was in my teens and 20's, I attended a jazz dance class five days a week. It's not a coincidence that I could eat anything I wanted, and I was in the best shape of my life. Unfortunately I don't have the time to dance five days per week, and at my age, even if I did I would still not be able to eat anything I want, but putting some dance back into my life will certainly go a long way towards improving my cardio fitness level as well as my flexibility. I've signed up for a Zumba class, just once a week, but already I'm enjoying myself thoroughly and look forward to the classes! How about you? Are you making any changes in your life? Remember, even simple changes can make a big impact! Disclosure: I wrote this blog post while participating in the SocialMoms and Simply Orange® blogging program. If I am one of the first 65 blogs received by SocialsMoms, I will receive a $25 Target gift card and a gift pack that includes a Simply Orange® cooler bag and logoed fleece. The views and opinions expressed here are my own. When I participated in the Susan G. Komen 3 Day for the Cure event last October as the Energizer Keep Going Blogger, I met many wonderful people who exemplified the Energizer Bunny's Keep Going® spirit. From crew members who woke up at 4AM every day to walkers who raised hundreds of thousands of dollars to breast cancer survivors who fought a horrible disease, these people are ordinary people like you and me who just don't know what it means to give up, and they are an inspiration to us all. Ten finalists will be selected and awarded a $1,000 donation to a charity of their choice, as well as a Flip camcorder to help in their campaign efforts to become the 2011 Energizer Keep Going® Hall of Fame Inductee. The Inductee is then chosen by an online public vote, receiving a $10,000 cash prize and a $5,000 donation to his or her favorite charity. Plus, he or she will be honored at a special awards ceremony hosted by Energizer Keep Going® Hall of Fame Honorary Inductee, Cal Ripken, Jr.
Energizer is currently seeking people with unwavering determination, an energetic spirit and the drive to make a difference to join Baseball Hall of Famer Cal Ripken, Jr. and others recognized for their unstoppable energy in the Energizer Keep Going® Hall of Fame. We all know someone who's persevered and made a positive impact. It could be a friend who's overcome the odds and kept going when the chips were down. It could be a relative who stuck to their dreams when no one else thought they had a chance. Or just someone whose simple act created a positive change in his community. Just like the Energizer Bunny®, they never give up. That person could be your sister, your best friend, your son, daughter, or even you! From now through Feb. 4, 2011, people are invited to enter their own personal stories or nominate someone they know online at www.energizer.com/halloffame. Just like America’s non-stop icon, the Energizer Bunny®, nominees should embody the Keep Going® spirit by making a positive impact on the world through extraordinary determination and courage. Cal Ripken, Jr., who became the first member of the Energizer Keep Going® Hall of Fame six years ago, is once again helping lead the search for the next Inductee. It’s all a part of Energizer’s Now That's Positivenergy™ campaign to help everyday citizens channel their power to make a positive impact, whether it be in their local community or around the world -- and you could be a part of it! To help kick off Energizer's Now That's Positivenergy™ campaign and celebrate the amazing people in the Energizer Keep Going® Hall of Fame, Energizer is giving away two four-packs of Energizer Max AA batteries to one lucky Bonggamom Finds reader! Leave a comment on this post telling me who you would nominate to the Energizer 2011 Hall of Fame, and why. This entry must be completed before extra entries qualify. 1) Nominate someone for the the Energizer 2011 Hall of Fame, then leave a comment here telling me you did (1 entry). 2) Share the link to this giveaway (http://ow.ly/3FYUO ) with your Facebook friends, then leave a comment here telling me you did (1 entry). This giveaway ends at 11:59PM PST on February 3, 2011; I will draw a winner at random on February 4 and post the winner's name after the winner confirms acceptance. US addresses only. For additional giveaway rules, click here. Good luck! Disclosure: I received a product sample, but was not paid to review the product or give my opinions. Program information is provided by the featured company/product and is clearly indicated in italics. The views and opinions expressed here are my own. Get ready, Dinosaur Train fans! PBS Kids is airing a new Dinosaur Train episode on January 17. My kids love watching Buddy the T-Rex and his adopted Pteranodon family go on adventures and learn about natural history and natural science, and they love the paleontologist who appears at the end of every episode and compares the dinosaurs they saw in the program to modern-day animals. The hit television series Dinosaur Train ® is roaring into 2011 with an all-new episode premiering Monday, January 17 on PBS KIDS® (check local listings). In the all-new episode, “The Good Mom;” “Diamond Anniversary,” Mrs. Pteranodon meets fellow mom Millie Maiasaura, who is a little too over-protective of her kids. The two moms share some time comparing mothering methods in a play date at the Big Pond. And, Mr. and Mrs. Pteranodon decide to surprise each other with gifts on their anniversary. DINOSAUR TRAIN, created by Craig Bartlett (Hey Arnold! ), embraces and celebrates the fascination that preschoolers have with both dinosaurs and trains while encouraging basic scientific thinking and skills. Each episode includes animated segments with live-action sequences featuring a paleontologist who brings to life the show's natural science and natural history curriculum for preschoolers, giving specific facts about dinosaurs and comparing their features to animals of today. To celebrate the premiere of the new Dinosaur Train episode, Dinosaur Train is giving away a Dinosaur Train footed pajama set (size 4T) to one lucky Bonggamom Finds reader! Available at Kohl’s, these “Dinosaur Train™ Striped Footed Pajamas” are the perfect way to keep toddlers warm and cozy during the winter months The dinosaur appliques and striped pattern on these footed pajamas offer timeless touches, and the footed design keep toes toasty. This giveaway ends at 11:59PM PST on February 1, 2011; I will draw a winner at random on February 2 and post the winner's name after the winner confirms acceptance. Pajamas are size 4T. Continental US residents only. For additional giveaway rules, click here. Good luck! In my perfect world, I'd be able to eat whatever I want and control my weight with exercise alone, but the sad truth is that unless I'm prepared to run a marathon every week, I need to make smarter choices about the food that goes into my body. That's one of the things I need to work on this year, so this year I'm ditching the ice cream and eating more yogurt. And with yummy, healthier products like Breyers YoCrunch 100 Calorie Packs and Fruit Parfaits, I can still indulge in an occasional sweet treat without getting sidetracked from my fitness goals. We've purchased quite a few YoCrunch Fruit Parfaits ever since we first reviewed them in September, so I was delighted to receive a second invitation to review the product -- along with their YoCrunch 100 Calorie Packs yogurt products. · Breyers YoCrunch Fruit Parfait: the first layered fruit, yogurt and granola parfait to be in local grocery stores. YoCrunch® Fruit Parfait™ is available in three classic fruit flavors -- strawberry, blueberry and peach. Consumers will be able to find this yogurt at leading grocery stores nationwide at a suggested retail price of $2.89 for each four-pack container. The last time I reviewed the Fruit ParYfaits, I mentioned that we all wished the portions were bigger. I think I've changed my mind -- I think it's good for my kids to get used to smaller portion sizes. These little cups pack quite a lot of sweetness and creaminess for just 100 calories, so let's keep the sizes the way they are! YoCrunch 100 Calorie Packs and Fruit Parfaits make a perfect snack or dessert, and the perfect way to indulge your sweet tooth for a reasonable number of calories! If you'd like to try these yummy yogurt parfaits for yourself (US addresses only), leave a comment on this post with your email address and tell me which flavor you would most like to try. If there are more than 10 entries on January 30, 2010, I'll draw 10 winners using the random.org random number picker. Good luck! Disclosure: I received promotional products and samples to facilitate my review, but was not paid to review the product or give my opinions. Product information is provided by the featured company/product and is clearly indicated in italics. The views and opinions expressed here are my own. I love our hardwood floors. Our bathrooms and laundry room have tile floors and the kids' room is carpeted, but all the other rooms in our home are hardwood because we love the look and feel of them. The only problem with hardwood floors is the echo they carry and the way they retain the cold in the wintertime, so we temper that by laying area rugs here and there. Since our home is in the Arts & Crafts Mission style, we tend to prefer more traditional rugs, but I have to admit I was pleasantly surprised at the great selection of modern rugs available at AllModern.com. Like all CSN Stores, they have a wide selection of products and free shipping on orders of over $69, so they're a great place to start looking for a new rug and new look for your home in the New Year. After only 5 minutes, I was able to find quite a few rugs that I'd love to decorate our home with! Even though the design is decidedly modern, the rectangular shapes and earth tones on this Sturya Stella Smith II Contemporary Rug would give a fresh, unexpected twist to the master bedroom. The yellow dots on this Flirty Pale Yellow Kids Rug look like the perfect complement to the yellow walls in our playroom! I can just imagine the kids enjoying themselves, jumping from dot to dot. Since AllModern.com is part of the CSN Stores family, once you're on the site you're just a hop, skip and a jump away from tens of thousands of other home decor products, including more traditional rugs like this Mission style rug below. It would be absolutely perfect to go underneath our dining room table. For a limited time only, use promo code JanuaryRug15 to get 15% off select area rugs over $100 at CSN Stores. Hurry, offer expires 1/19! Disclaimer: I am a CSN Preferred Blogger, and CSN Stores is compensating me for this post in the form of a CSN store giftcard. The views and opinions expressed here are my own. Bonggamom's Friday Finds is back for 2011! It's such a wonderful feeling to have 52 whole weeks of giveaways stretched out in front of us. I'm sure many of you have already hit the New Year running, with some awesome giveaways for your readers -- so please feel free to leave your links here in the hopes that even more people will find your giveaways and your blog. The more, the merrier, right? And if you love joining giveaways, 2011 might be your lucky year -- with so many giveaways, it's bound to be! Just click on the links below to enter. Once again, Happy New Year, and may 2011 be filled with even more of the Bestest Giveaways Around the Blogosphere! A couple of days ago I blogged about my determination to get back into running this year. It's one of my New Year's Resolutions for 2011. Note, I've tried to fashion a resolution more specific than just "Lose Weight" or "Get Fit", because I know those never last. But running, I can do (and if a bit of weight comes off, then hurray for me). I have the spiffy new running shoes that I bought at the end of 2010. I've signed up for some races to keep me motivated. I think I'm set. One of the major stumbling blocks I have that keeps me from running as much as I want is my plantaar fascitis, or heel spurs. Two years ago the pain was so bad I had to stop running, but last year it seems to have eased off -- and I've learned how to manage the condition when it does occur. The simple act of applying a cold compress to my heel after a run has been crucial to avoiding pain the morning after. In the past I've used bags of frozen peas because unlike solid blocks of ice, they envelop the heel quite nicely, and unlike bags of crushed ice, they don't leak and soak my couch. The only problem is that peas are food, and resting my stinky foot on a bag of food (even when enclosed in a plastic bag) is, well, gross. But it's a New Year, and it's time for a new kind of cold therapy. MomImpact sent me a sample box of Arctic Ease, a resusable wrap or pad that cools without needing refrigeration. Technically, Arctic Ease is a Cryotherapy wrap that aims to enhance the treatment of soft tissue injuries, burns and edema, whether induced by pharmalogical therapies, radiation or injury (I got that from their "About" page). In everyday English, that means Arctic Ease is the coolest cold bag ever! Arctic Ease Cryotherapy Wraps and Pads provide instant cold relief for the pain and swelling from bumps, bruises, and other injuries. They don't need refrigeration -- they are cold right out of the bag. The wraps and pads feel like cloth that has been coated with some kind of gel. My understanding is that the gel draws away the heat from the injured area and provides the cooling effect. The gel absorbs the heat, but the heat then evaporates, which means the area is kept cool for an extended period of time. God, I love it when companies apply science to come up with products that make our lives better! * Instant cooling relief! I love the fact that you don't have to refrigerate it because that means I can leave a pack in the first-aid kit in our van. I was given several sample packs, and even though I waited over a month to open the last pack, it was still ice-cold. Actually, "ice cold" isn't the right term, because while you can really feel the cold, it's not an unbearable cold. It's gentle, even and long-lasting. It's more like "gel-cold", but even then, it's not icky-wet or icky-gooey! * You can cut the wraps or pads to fit your injury so it's not too bulky. This is also great when you have twin boys who have injured each other and both need cold compresses! * They are reusable. Just put them back into the resealable pouch when the coldness has worn off, and rehydrate the wrap or pad by adding a tablespoon or two of water into the pouch. After several hours, it will be cold and ready to reuse. See, once again, this is perfect to keep in the car! My understanding is that you can get several uses out of the product before the gel dries out completely and the wrap or pad no longer adheres to the injury. At that point, you'll need to discard it and buy a new one. The gel can feel a bit icky at first, but you'll get used to it. And although it's reusable, you can't wash it -- which means the Arctic Ease wraps for my heel are strictly for my heel only, and I can't ever step on the floor while I'm using the wrap, because I shudder to think how much dust and dirt it would pick up. But since Arctic Ease is pretty inexpensive ($7.99 for a pack of 3 pads, and $10.99 for a 4"x60" wrap), that's a minor inconvenience. Every household needs to keep a pack of Arctic Ease wraps or pads around! Arctic Ease is throwing a Twitter Party! It's going to be hosted by the awesome MizFitOnline, and I'll be joining her as a panelist, along with Joyce of Freaking Fitness, Lisa of Lisa Johnson Fitness, and Cara from Arctic Ease. We'll be talking about health and fitness in the New Year -- making health and fitness goals, achieving them, maintaining them. Gulp. These women are fitness goddesses! I guess I'll be there to provide the perspective of the Ordinary Woman. In any case, it's an important topic for me and everyone else, so I'm honored to be joining them and excited to start the party. And what would a Twitter Party be without prizes? Throughout the event, Arctic Ease will be giving away Arctic Ease prize packs (ArcticEase samples+ gift cards), as well as a grand prize (worth $100+) to end the hour-long chat! Anyone and everyone is welcome to drop in and join the party, but if you RSVP at MizFitOnline's #CoolWrapsFitness party post, you'll be eligible for a special, high-value ($100+) prize. Hope to see /tweet you at the party next week! One lucky Bonggamom Finds winner will receive an Arctic Ease Prize Pack with three Arctic Ease Wraps and a t-shirt! Leave a comment on this post and tell me how you would use Arctic Ease wraps. This entry must be completed before other entries will count. 1) RSVP to Arctic Ease's #CoolWrapsFitness Twitter Party on MizFit Online (1 entry). I RSVP'd to the #CoolWrapsFitness Twitter Party! I can't wait to join MizFitOnline, Bonggamom and other great panelists on Jan. 13, 7-8PM CST to chat about health and fitness in the New Year. Join us and RSVP at http://ow.ly/3A4tJ for the chance to win great prizes! 5) Follow Bonggamom Finds on Blogger (1 entry). 8) Join any of the other open giveaways on Bonggamom Finds (leave a comment with the name of the giveaway you joined, 1 entry per giveaway you've joined). This giveaway ends at midnight PST on January 24, 2011; I will draw a winner at random on January 25. I will post the winner's name in the comments section after he/she confirms acceptance. Continental US residents only. Please note, entering this giveaway does not increase your chances of winning a prize at the Arctic Ease Twitter Party. For additional giveaway rules, click here. Good luck! Disclosure: I received a sample of Arctic Ease products to facilitate my review. I have not been compensated for this post but I am being compensated for my participation in next week's Arctic Ease Twitter Party. 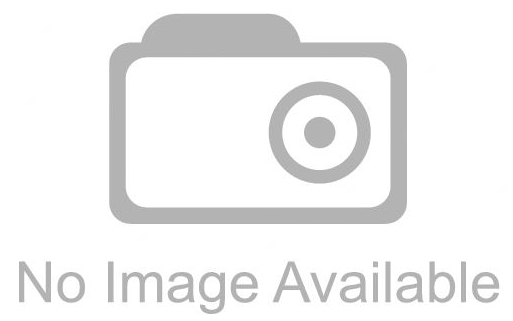 Product information is provided by the featured company/product and is clearly indicated as such. The views and opinions expressed here are my own.